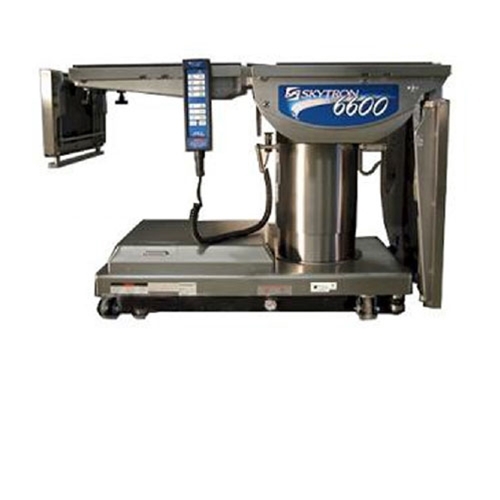 The Skytron 6600 general purpose surgical table provides unparalleled imaging access for today’s most demanding cases while lifting 1000 pounds and articulating 600 pounds. The removable Back and Leg sections facilitate the use of a carbon fiber Back and Leg sections to further extend the imaging window. The rotating top of 210° further enhances C-arm and microscope access along with more leg room for a seated surgeon and in many cases, better surgical access. A stable footprint and rigid surface provide assurance that the patient position will be maintained as desired. The table can also be upgraded to add an X-ray top providing unobstructed passage of X-ray film cassettes up to 14 inches by 17 inches. The 6600 Series table has been fully tested to four times its rated capacity to provide caregivers with total confidence when positioning patients weighing upwards of 600 pounds. This model is also equipped with a manual brake release that is independent of the main controls that require no power to operate. The table also features a complete set of back up controls that are conveniently located on the base in the event the Back-Lit hand control is damaged during a case. Finally, for additional stability, the 6600 Series features a 4-point “auto-leveling” braking system with the brakes being located at the outer corners of the base. 26" to 45" elevation range. Pendant control has a non-slip rubber cover and spring clip hanger on the back.